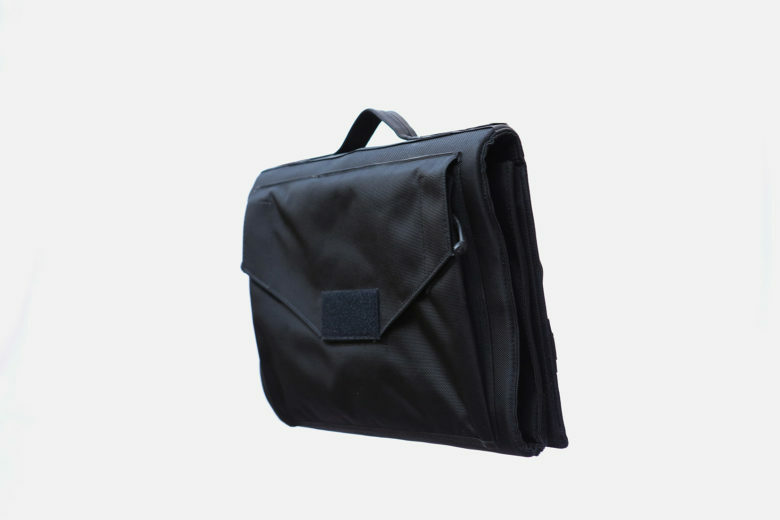 This shoulder bag protects your laptop - and body in case of gunfire. We plan for when our batteries run low, packing our shoulder bags with laptop cords and external batteries for our smartphones. But should we also plan for an active shooter? Believing it is better to be safe than sorry, the Force Training Institute has created a bulletproof laptop bag that instantly deploys into a 3-foot shield to defend against gunfire. Has it come to this, that we have to carry a bag called the MTS, short for Multi-Threat Shield? Sales, according to a spokesperson, have been brisk since last year’s San Bernadino shooting. Force Training Institute fills between 50 and 100 orders each month, many for police, military and special ops groups that need to keep a low profile in the field. It recently received approval to begin filling orders overseas. FTI makes it its business to be hypervigilant, with a diverse range of security services, including private security, guard dogs, firearms courses and active shooter mitigation training. It boasts of clients that include Fortune 500 companies, retailers, hospitals, airports, military units and security and law enforcement agencies. Training definitely saves lives, but it can’t provide cover when gunfire erupts and you’re in an area with no cover. With the 8-pound MTS on your shoulder, the carrier can grab the handle, flick the wrist and unfurl the laminated Kevlar shield to stop most handguns, shotguns and pistol caliber submachine gun fire. From stylish carryall to bulletproof shield with the flick of a wrist. Seeing is believing and the video below shows men skilled in firearms popping caps of various sizes into the deployed bag, which folds out to cover 36.5 inches in length and 17.5 inches in width. Even in instances when the slug broke through the exterior, it was stopped by an inner layer of ballistic-resistant material. The bag is constructed with a shock pad to provide protection from sharp objects, punches and kicks. The MTS received a Threat Level IIIA rating from the National Institute of Justice after test results showed “no penetration,” according to the FTI website. As a bag, it has room for a laptop, tablet, handgun or taser. Stylish laptop bags are not cheap these days. One with the function of the MTS could be looked at as money well spent, especially if you are in a dangerous line of work. The MTS sells for $899 on the FTI website. Shipping is free. It comes in one color: black.